Unit Badges – What are they? 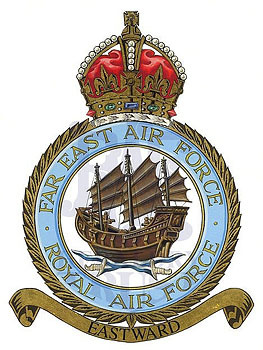 One element of the ceremonial/ heraldic attributes of RAF units is that of the unit badge, often referred to (wrongly) as the crest. Have been in existence for at least 2 years – and likely to stay in existence. It is obvious that both of these aspects are somewhat subjective, most minor units from World War Two had little chance of surviving the inevitable (win or lose) disbandment process – yet this did not stop them putting forward their claims. In other instances squadrons which would seem to be likely candidates appear not to have bothered. The second criterion is even more ‘arbitrary’, there being no detailed guidance available it was simply a question of put in the request and then wait and see. As you will see as you browse the RAF Heraldry Trust collection, a number of World War Two squadrons that ‘should’ have had a badge do not have one, whereas many post-1945 units, especially the non-flying units, have been around quite a long time and have badges. Sadly, it is many of these latter units for which the Trust is having difficulty finding sponsors! 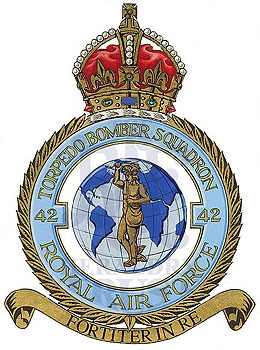 Unit badges were only recognised as official once they had been accepted by the RAF Inspector of Badges, given sanction by the Chief of the Air Staff, and approved by the Sovereign. The general outline of the badge followed a fixed pattern of an edged circle, surmounted by a crown and with a scroll at the base. 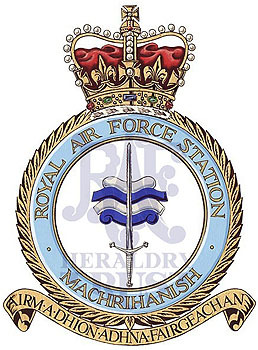 Up to 11th November it employed a Tudor crown (often referred to as a King’s crown) – as shown by the 39 Squadron badge on the left, but after that date it used St Edward’s crown (the ‘Queen’s crown) – as shown by the RAF Machrihanish badge on the right. 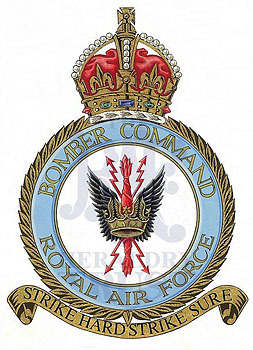 The initial step was to submit, via the appropriate ‘chain of Command’ a draft sketch of the motif and motto to the RAF Inspector of Badges, at the College of Heralds, including a statement of how the design/motto were arrived at – i.e. the origin and significance. The Inspector would then make his suggestions as to amendments such that the design followed the precepts of heraldry and the motto made sense. This latter point was important as most chosen mottos were in Latin and few squadrons boasted high grade Latin scholars amongst their number. Along with the draft the unit had to send 15 guineas for the Inspector’s fee! 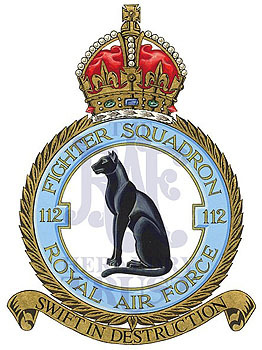 Mottos and devices had been in use with many units, especially the flying squadrons, since the earliest days of the RAF; during the 1920s many units designed, and employed, unofficial squadron badges – in many cases these became the basis for the official badge. 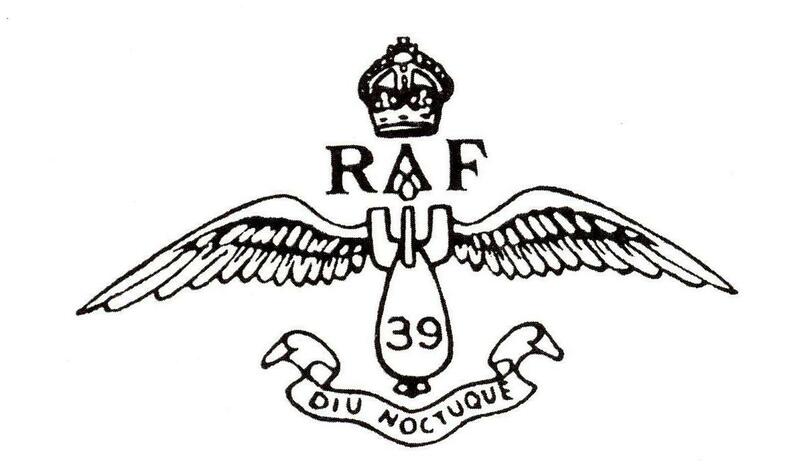 The example of 39 Squadron is fairly typical. During the mid-1920s the DH. 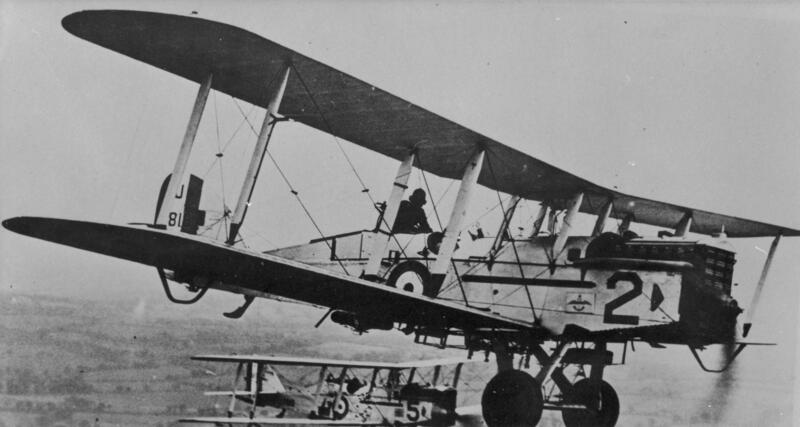 9As of 39 Squadron were frequent participants in the annual Hendon Air Pageants; just prior to the 1926 Display the Squadron Commander, Squadron Leader HV De Crespigny, devised a motif for use on the aircraft. This design is shown at image to the left and on the photograph on the right you can see it on the nose the DH9A. 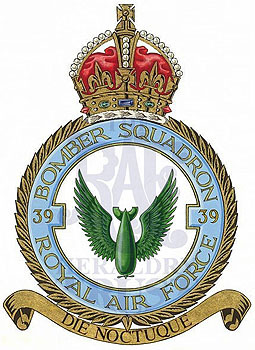 After consultations with the other pilots it was decided to adopt a bomb, to signify the bombing role carried out by the squadron, but with the addition of wings, the initials ‘RAF’ and a crown (see below); to leave no doubt as to which squadron this belonged to, the number ’39’ was placed within the bomb. To complete the device a scroll was added with the inscription ‘DIU NOCTUQUE’ – the intended translation being ‘By Day and by Night’, to reflect the squadron’s glorious past as a night-fighter unit and its present day role; however, it seems that the Latin was not too good and it was generally read as ‘By God, By Night’, not as intended but no doubt a true reflection of the ‘terrors’ of night operations! With the granting of an official badge in 1936 the motto was changed to ‘DIE NOCTUQUE’, thus ending the ‘error’. Squadrons were very proud of their badges and whilst never perhaps the same as the ‘Regimental Family’ concept in the Army, they did form a focus within the unit and a matter of pride (and banter) between units. The badge was used and displayed in all manner of ways. 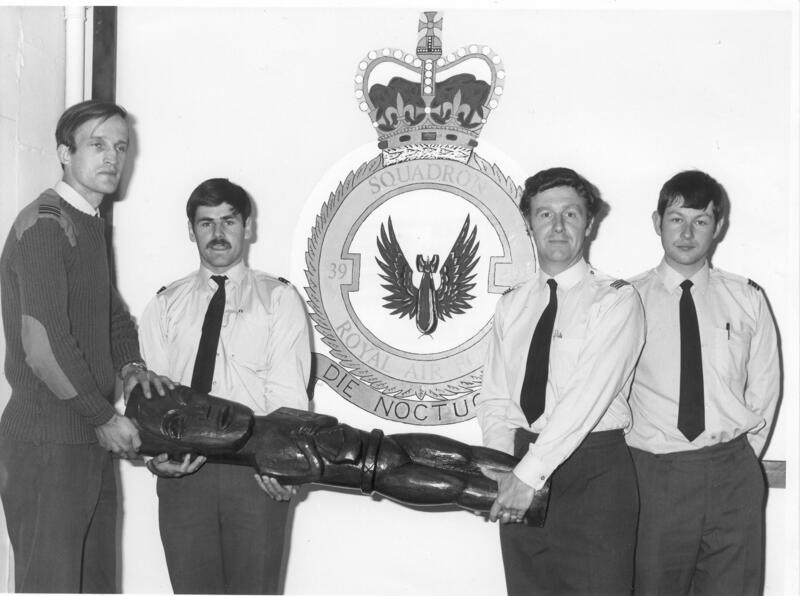 The photograph to the right shows the 39 Squadron badge painted on the wall of the aircrew crew room at Wyton in the late 1970s, whilst – not at all connected with badges – four of the aircrew (the author included) pose with ‘Kon Tiki’, one of the Squadrons ‘mascots’, which is about to be moved to a new location. 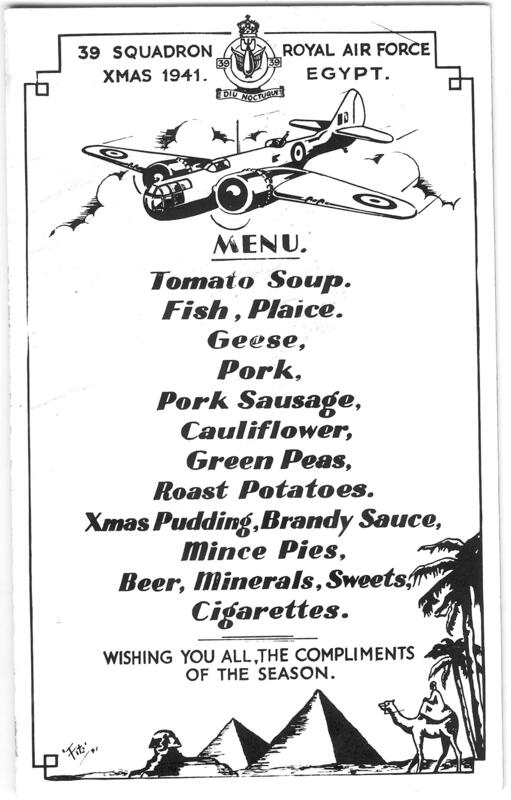 Centre: Christmas menu 1941, with badge at top centre, and Martin Maryland, menu (seems good!) and then ‘images of Egypt’, as the Squadron was in the Middle East. This makes a menu like this an interesting document! We are collecting such documents – so if you have any, please send them to historian@rafht.co.uk. 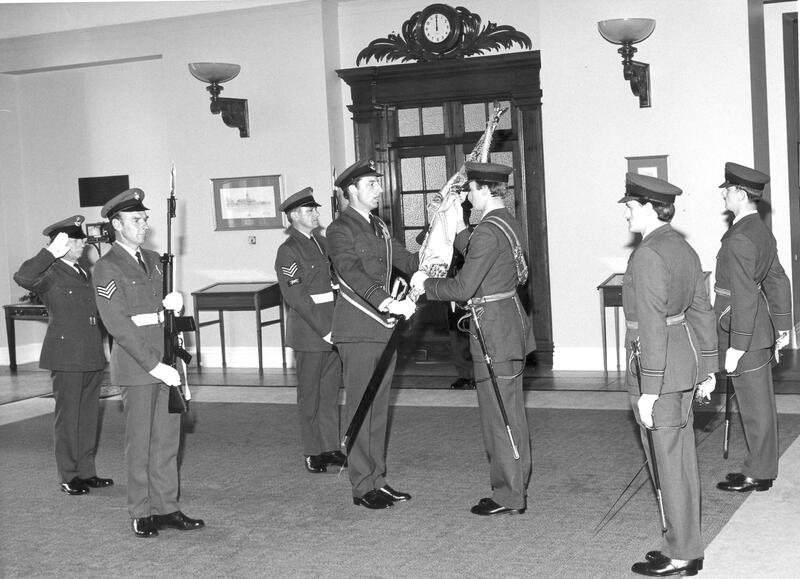 Right: Handing over of the Squadron Standard June 1982; the badge is the centre piece of the Standard, surrounded by the Battle Honours, although a Squadron often has more Battle Honours than those displayed on the Standard. The stories behind the motifs are often somewhat hidden, although for each badge we include a comment in the Link to indicate why the motif was chosen, as this was part of the discussion with the Chester Herald. However, seldom is the full story known, and we would appreciate insights from anyone who may know specific details! One exception to this is the file that Ken found when researching for his Bomber Command book. 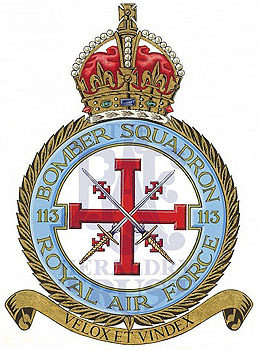 The file contained the correspondence between the CO of 171 Squadron and the Chester Herald concerning the Squadron Badge. 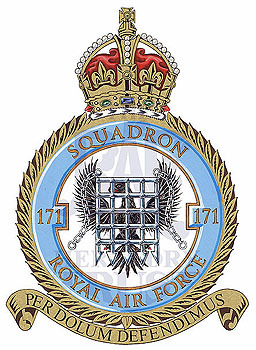 Click on the 171 Squadron badge to go the story. The unit number was placed at the opposite mid points of the outer circle, the remainder of the text within the circle varying dependent upon the type of unit involved. 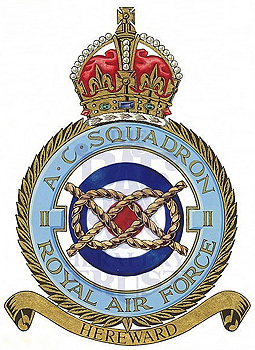 However, in general terms the text was to include the word SQUADRON (or unit designation as appropriate) and the words ROYAL AIR FORCE (or AUXILIARY AIR FORCE). 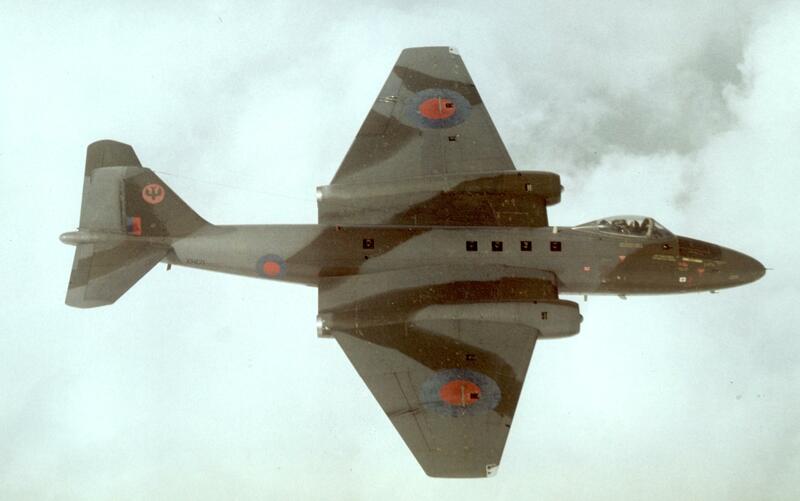 Numerous changes were made to this, with, for example, the addition of squadron role (e.g. Torpedo Bomber).